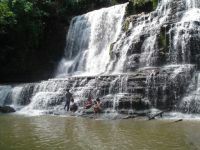 ZAMBOANGA CITY, Jan. 6 (PIA 9) - - After long years of “nesting” unnoticed and “untouched,” Merloquet Falls finally caught the city’s attention to include her in the eco-tourism development. “This hidden and unspoiled natural falls is one of those attractions included in the city’s promotional materials,” Covarrubias shared. Zamboanga city mayor Celso Lobregat, on Wednesday, along with some members of the city council and other city officials including Archbishop Romulo Valles trek the rugged and steep terrain leading to the breathtaking Merloquet Falls. According to Covarrubias, the team’s visit to the falls is a show that the city wants to help promote the scenic falls as one of the city’s famous attractions. The mayor himself took a wade into the cold and clear water that falls into a natural pool. Covarrubias said the visit to the falls was a sidelight to the inauguration of 9 infrastructure projects in Mangusu and Sibulao amounting to P16.1million lead by Mayor Lobregat. The lady IO said, after the exhausting inauguration, the team took a trek to the interiors of barangay Sibulao, Sitio Merloquet, some 78 kilometers east of city where the falls’ majestic beauty lies.